In the humanities, what are the settings of interpretation? How does design allow us to rethink the normalization of scenarios as well as “the user”? In this case, Sara Hendren’s work on accessible architecture is compelling. How is interpretation embodied and situated in time and space? How does design help us attend to the particulars of situations, especially to the particulars that matter or make a difference? Here, we repeatedly drew from Karen Barad’s work on mattering and boundary-making practices. What does a given design value or reify, and who does it exclude? Simone Browne’s recent work on surveillance technologies and practices is very informative here. How is design also inquiry, or not simply an instrumental means to an end? Here, we considered work by Carl DiSalvo, Daniela Rosner, and Anthony Dunne and Fiona Raby. How are projects designed to be maintained and repaired over time? Which design methods frustrate “make or break” models premised on innovation above all else? In this instance, we might visit the “Reclaiming Repair” project by Lara Houston, Steven Jackson, and Daniela Rosner. How might humanities projects start with design instead of ending with it? That is, how is design much more than the “polish” we apply to surfaces immediately prior to publication or release? Here, Anne Balsamo’s work on design and culture is key. How might we design contexts for interpretation, not just stuff or objects? The book, Context Providers, by Margot Lovejoy, Christiane Paul, and Victoria Vesna, prompted this question in particular. Finally, how might design foster deviance in interpretation, or expose and experiment with norms in a material or affective way? I was honored to present with Kim, Padmini, and Jacque. Our MLab work is inspired by Kim’s “Fashioning Circuits” project, Padmini’s work on “making culture,” and Jacque’s collaborative approach to data, sound, and touch. My notes for the panel, which was oriented toward group discussion, are below. They draw from my experiences with the Kits for Cultural History project. In the MLab, we’ve been “prototyping the past” by prototyping absence, a process that involves remaking historical technologies that no longer exist, no longer function, or exist only in part in museums and collections. 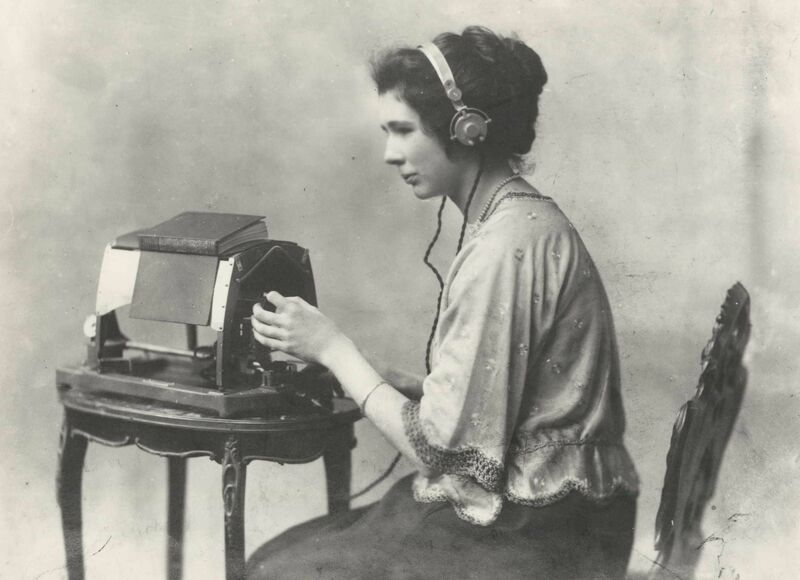 Thus far, we’ve remade technologies such as early wearables (1860s), early magnetic recording devices (1890s), and early optophones (1920s-40s). In so doing, we produce digital models of these technologies as well as tactile components for assembly. These materials are circulated online and by post, and we also exhibit them in galleries and other memory institutions. With them, our aim is to not only test historical claims about early technologies—how they functioned, how they were embedded in culture, and how they were maintained—but also foreground the labor at play in them, including work by people such as Mary Jameson (a key developer of optophones; photographed below) who are largely, if not entirely, absent from scholarship in media history. At the same time, we research against the assumption that we can inhabit or fully recover the positions of people and things in the past. Design as an attribution practice, which attends to the intricacies and specificities of labor. For instance, we often use patents and illustrations to prototype early technologies in 3-D. However, patents very rarely give attribution to people who ultimately maintain or develop the technologies at hand. To what degree can design highlight those missing names today? Or how can it prompt people to consider important differences between labor now and labor then? Design as inquiry (see Rosner), where we develop scenarios for interpretation, not replicas of historical objects. When we tell people we’re prototyping the past, they tend to assume we’re making exact reproductions for display and circulation. However, we’re not invested in copies. We’re interested in treating design like writing, archival research, and trial-and-error experimentation, among other techniques. The resulting objects manifest arguments made about the past, not re-presentations of history. How, then, might design resist tendencies to treat objects that look historical as historical reconstructions? Design for experience (as opposed to form) without “users,” but with people who are negotiating with materials—testing, twisting, bending, altering, misusing, repurposing, glitching, and critiquing what’s in circulation. Put differently, we’re leery of creating instructions for people or giving them step-by-step instructions to follow in order to assemble early technologies, in part because instructions are biased (e.g., the invisible narrator) and generally foreclose spaces for experimentation or alternatives. How do we design research so that inquiry continues through other entanglements of meaning with matter (see Barad), against the “receipt” of dead objects to be used or frozen labor to be cited? Design for responsibility. The very word, “prototyping,” typically elicits speculations about the future, but we can conjecture about the past, too. (See Butler and Kraus.) When we do, we need design paradigms that push conjecture beyond play or “screwing around” toward responsibility: to recognize how experiments with history involve spectres of the past. Through sonification, tactile media, and collective experience, Wernimont and Stern’s The Eugenic Rubicon gives us examples of how to engage history with such sensitivities (or sensitive data) in mind. In short, how do we design to combine entanglement with action and attention to difference? Design for diffraction (see Barad and Wark), where prototypes of the past do not duplicate or mirror history but instead navigate and foreground our contingent relations with material culture. The past and present are produced together, over and over again, with patterns and change. Following Wark’s language (see pages 158-165 of Molecular Red), we might say that prototyping the past does not prototype the objects of history; it prototypes processes of knowledge with an emphasis on the apparatus of knowledge production. How might design focus on the physical arrangements and phenomena that distinguish process from product, observer from observation, or this sensation from that one—on the matter, meanings, and practices that, in short, make boundaries? I’m in the middle of writing a short publication (in design studies) that details some of these points. More soon! Post by Jentery Sayers, attached to the KitsForCulture project, with the news, fabrication, and physcomp tags. Featured image care of HASTAC 2016.